Very easy. Tracked via royal mail. My usual postman delivered at normal time. Just needed to sign for package. Done. Very happy. Brilliant easy to use website, very quick delivery service, very good exchange rate, this is my third time using Travel Money and have also recommended them to my sister. Thanks very much for placing your travel money order with us. We are disrupting the travel money market with a new business model which gives our customers their travel money at cost (ie with no hidden margins). That's why our exchange rates are so much better than everyone else's. 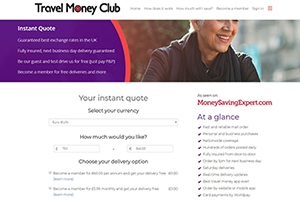 We make our money from Premium membership - you pay £60.00 a year for unlimited free deliveries, next business or nominated day delivery, delivery to work and other non-cardholder addresses, £10k annual exchange limit, our clever currency toolkit to help manage and boost your travel money, refer-a-friend rewards, and travel perks such as airport parking discounts. You have used our free Standard service to trial our service - hence the £2.5k annual exchange limit and the £9.95 delivery charge. If you will be travelling again this year, do please sign back in to your account and use the chat to get in touch and we'll refund your postage against the first year's Premium cost if you would like ti upgrade. We have used this sight for many years as we always find the best rates much better than the high street and the staff are always so helpful if you have any problems. I would definitely recommend every time. Perfect. Delivered on time and good rates. Very easy process. Money arrived when promised. Ordered Australian dollar's on Friday and I received them on Saturday morning. Even with the £20.00 delivery charge (which is optional), I got more Australian dollars than other online currency companies could offer. I was kept updated with every stage of the transaction and tracking information. Thank you for a pleasant experience. Good exchange rate and money arrived when promised. Best exchange rate even with delivery charge, included tracking info. I had no hesitation in giving five stars. The whole experience was hassle free and the rate was still better than anywhere local even with the added expense of p+p. Bought 200 euros and delivered on the expected date. Great service! Very smooth and hassle free got all the correct money. Only two things I would suggest and that is 1, if over a certain amount then free delivery like many other companies do however I know this won't happen due to your membership side of things 2, i requested mixed dominations but virtually all of it is HIGH dominations maybe an option for the customer to request the dominations they need. Received my zloty's on time . Excellent service.